Will Bad Jobless Data Spur Action On Unemployment Insurance? : It's All Politics Just as the Senate seemed to descend into another round of partisan gridlock, this time over extending emergency jobless benefits, the arrival of a surprisingly weak December jobs report raised the pressure on lawmakers to act. Just as the Senate seemed to descend into another round of partisan gridlock, this time over extending emergency jobless benefits, the arrival of a surprisingly weak December jobs report raised the pressure on Congress to act. The question is whether news that the economy created a mere 74,000 jobs last month — far fewer than the 200,000 forecasters predicted — delivered enough of a jolt to Capitol Hill, where what seemed like bipartisan progress on the issue early in the week had reverted to partisan nastiness. Majority Leader Harry Reid, D-Nev., used Friday's underwhelming jobs report to argue for Congress to extend the unemployment insurance program. "Today's report shows why Republicans must join with Democrats to immediately extend emergency unemployment insurance for the 1.4 million Americans whose benefits were cut off in December," he said in a statement. On Tuesday, legislation to extend jobless benefits surprisingly cleared a procedural hurdle in the Senate with bipartisan support. But things started coming apart after Reid denied Republicans the opportunity to offer amendments to the bill, charging them with obstruction and other acts of bad faith. That resulted in several Republicans withdrawing support. By Friday, Reid was willing to consider a certain number of GOP amendments, so long as they were "relevant," a Reid aide told the Washington Post. Senate Republicans weren't sure what to make of that. "Their position seems to change by the hour, so it's hard to keep up," said Don Stewart, a spokesman for Kentucky Republican Mitch McConnell, the Senate minority leader. When the Senate returns to work next week, two unemployment insurance bills offered by Democrats will be waiting. A bill introduced by Jack Reed, D-R.I., and Dean Heller, R-Nev., would extend emergency jobless insurance benefits for only three months, the idea being that it would allow Congress to buy time to reach a longer deal. 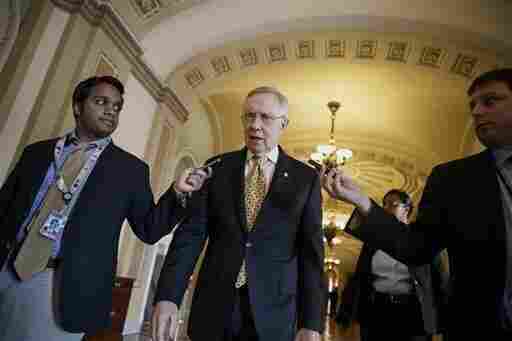 Majority Leader Reid, meanwhile, has offered a bill to extend benefits for 11 months. It would offset the $17 billion cost by extending the mandatory budget cuts from sequestration. For different reasons, Senate Republicans and some House Democrats aren't fans of that idea. Meanwhile, at the center of this dispute are millions of the long-term unemployed whose insurance benefits have run out or are due to expire by mid-2014. The National Employment Law Project estimates that nearly 1.7 million people have already seen their benefits expire with a cessation of the federal emergency unemployment insurance program, which was started in 2008 during the recession. It says 3 million more will lose their benefits by midyear if Congress fails to act. Without that extra federal help, the unemployed are again reliant on the benefits of their state, with a maximum of 26 weeks of unemployment insurance in most states.